Sam Houston (March 2, 1793–July 26, 1863) was an American frontiersman, soldier, and politician. As commander of the forces fighting for Texas’ independence, he routed the Mexican troops at the Battle of San Jacinto, which essentially won the struggle. Over his long career, he was a successful and effective statesman, serving as congressman and governor of Tennessee and the first and third president of the Republic of Texas, before becoming a U.S. senator and governor for the state of Texas. 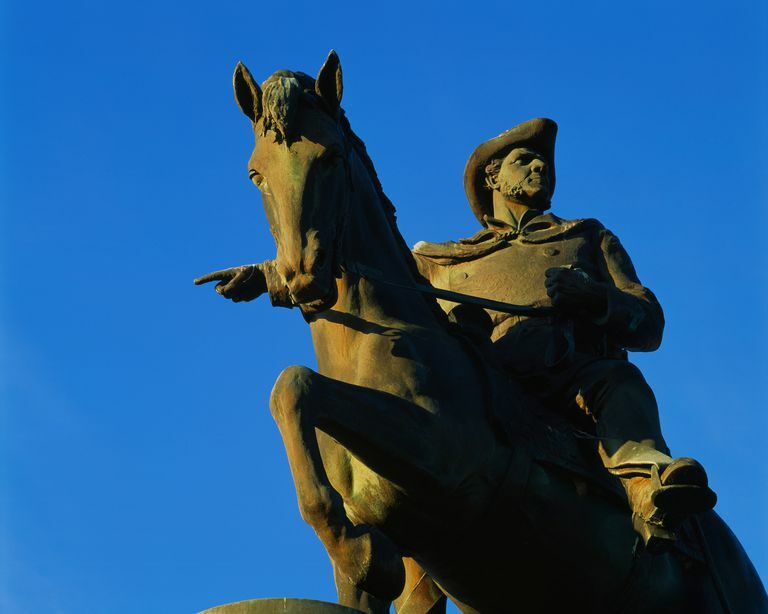 Known For: After winning the Battle of San Jacinto, which effectively won the Texas War of Independence, Houston was the founding statesman of Texas, serving as the first president of the Republic of Texas, then a U.S. senator and governor for the state of Texas. Notable Quote: "Texas has yet to learn submission to any oppression, come from what source it may." Houston was born in Virginia in 1793 to a middle-class family of farmers. They "went West" early, settling in Tennessee—which was, at that time, part of the western frontier. While still a teenager, he ran off and lived among the Cherokee for a few years, learning their language and their ways. He took a Cherokee name for himself: Colonneh, which means Raven. Houston enlisted in the American army for the War of 1812, serving in the west under Andrew Jackson. He distinguished himself for heroism at the Battle of Horseshoe Bend against the Red Sticks, Creek followers of Tecumseh. Houston soon established himself as a rising political star. He had allied himself closely to Andrew Jackson, who in turn came to see Houston as a protégé. Houston ran first for Congress and then for governor of Tennessee. As a close Jackson ally, he won easily. His own charisma, charm, and presence also had a great deal to do with his success. It all came crashing down in 1829, however, when his new marriage fell apart. Devastated, Houston resigned as governor and headed west. Houston made his way to Arkansas, where he lost himself in alcoholism. He lived among the Cherokee and established a trading post. He returned to Washington on behalf of the Cherokee in 1830 and again in 1832. On the 1832 trip, he challenged anti-Jackson Congressman William Stanberry to a duel. When Stanberry refused to accept the challenge, Houston attacked him with a walking stick. He was eventually censured by Congress for this action. After the Stanberry affair, Houston was ready for a new adventure, so he went to Texas, where he had purchased some land on speculation. He was also charged with reporting to Jackson about the political climate and events in Texas. On October 2, 1835, hotheaded Texan rebels in the town of Gonzales fired on Mexican troops who had been sent to retrieve a cannon from the town. These were the first shots of the Texas Revolution. Houston was delighted: by then, he was convinced that Texas' separation from Mexico was inevitable and that the fate of Texas lay in independence or statehood in the United States. He was elected head of the Nacogdoches militia and would eventually be appointed major general of all Texan forces. It was a frustrating post, as there was little money for paid soldiers and the volunteers were hard to manage. Sam Houston felt that the city of San Antonio and the Alamo fortress were not worth defending. There were too few troops to do so, and the city was too far from the rebels' east Texas base. He ordered Jim Bowie to destroy the Alamo and evacuate the city. Instead, Bowie fortified the Alamo and set up defenses. Houston received dispatches from Alamo commander William Travis, begging for reinforcements, but he could not send them as his army was in disarray. On March 6, 1835, the Alamo fell. All 200 or so defenders fell with it. More bad news was on the way, however: on March 27, 350 rebel Texan prisoners were executed at Goliad. The Alamo and Goliad cost the rebels dearly in terms of numbers of soldiers and morale. Houston's army was finally ready to take the field, but he still had only about 900 soldiers, far too few to take on General Santa Anna's Mexican army. He dodged Santa Anna for weeks, drawing the ire of the rebel politicians, who called him a coward. In mid-April 1836, Santa Anna unwisely divided his army. Houston caught up with him near the San Jacinto River. Houston surprised everyone by ordering an attack on the afternoon of April 21. The surprise was complete and the battle was a total rout with 700 Mexican soldiers killed, about half of the total. The other Mexican soldiers were captured, including General Santa Anna. Although most of the Texans wanted to execute Santa Anna, Houston did not permit it. Santa Anna soon signed a treaty recognizing Texas' independence which effectively ended the war. Although Mexico would subsequently make several half-hearted attempts to re-take Texas, independence was essentially sealed. Houston was elected the first president of the Republic of Texas in 1836. He became president again in 1841. He was a very good president, attempting to make peace with Mexico and the Native Americans who inhabited Texas. Mexico invaded twice in 1842 and Houston always worked for a peaceful solution; only his unquestioned status as a war hero kept more bellicose Texans from open conflict with Mexico. Texas was admitted to the United States in 1845. Houston became a senator from Texas, serving until 1859, at which time he became governor of Texas. The nation was wrestling with the slavery issue at the time and Houston was an active participant in the debate, opposing secession. He proved a wise statesman, working always toward peace and compromise. He stepped down as governor in 1861 after the Texas legislature voted to secede from the Union and join the Confederacy. It was a difficult decision, but he made it because he believed that the South would lose the war and that the violence and cost would be for naught. Sam Houston rented the Steamboat House in Huntsville, Texas in 1862. His health took a downturn in 1862 with a cough that turned into pneumonia. He died on July 26, 1863, and is buried in Huntsville. The life story of Sam Houston is a gripping tale of rapid rise, fall, and redemption. His second, greatest ascent was remarkable. When Houston came west he was a broken man, but he still had just enough prior fame to immediately take an important role in Texas. A one-time war hero, he prevailed again at the Battle of San Jacinto. His wisdom in sparing the life of the defeated Santa Anna is considered to have been crucial to sealing Texas' independence. Through this second rapid rise, Houston was able to put his more recent troubles behind him and become the great man that had seemed to be his fate as a young man. Later, Houston governed Texas with great wisdom. In his career as a senator from Texas, he made many prescient observations about the Civil War that he feared was on the nation's horizon. Today, many Texans consider him among the greatest heroes of their independence movement. The city of Houston is named after him, as are countless streets, parks, and schools. Brands, H.W. Lone Star Nation: The Epic Story of the Battle for Texas Independence. Anchor Books, 2004. Henderson, Timothy J. A Glorious Defeat: Mexico and its War with the United States. Hill and Wang, 2007. Kreneck, Thomas H. “Houston, Samuel.” The Handbook of Texas Online| Texas State Historical Association (TSHA), 15 June 2010.